Composite water anomaly index map for Venezuela Dec 2014-Nov 2015 (Location of Guri Dam highlighted). The map is based on 3 months of observed data (Dec14-Feb15) and nine months of forecast data (Mar15-Nov15). It shows that Venezuela is expected to experience widespread deficits, with large portions of the country experiencing exceptional deficits conditions (return periods greater than 40 years). 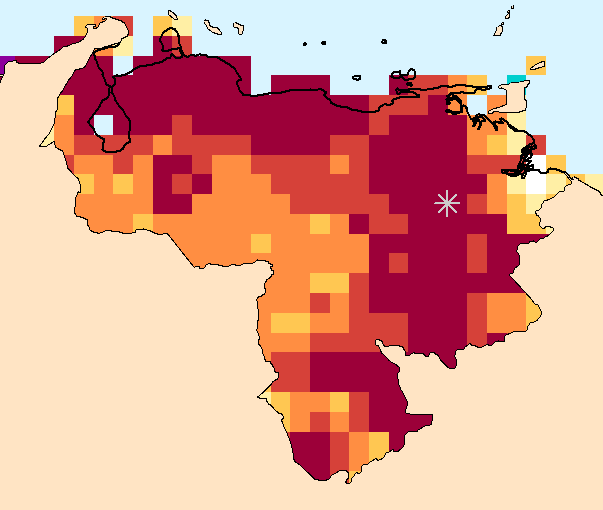 These areas include the heavily populated northern coast of Venezuela and the watershed for the Guri Dam (starred on the map) that provides 65% of Venezuela’s electricity supply. The water levels at the Guri Dam are currently at their lowest levels since 2010 and have been declining rapidly since early December 2014. Venezuela’s economy is already severely stressed due to low oil prices and mismanagement. Additional burdens due to drought and electricity shortages would add to those stresses. This blog post presents results from our March 2015 “WSIM Global Water Monitor and Forecast” report. This report is based on observed temperature and precipitation through February 2015 and an ensemble of 28 temperature and precipitation forecasts issued by NOAA's CFSv2 the last week of February 2015.